Probably the best known of all the packages, we can install or repair all generations of Sky equipment from standard Sky boxes through to the latest HD versions. We can also fit Sky to single or multiple rooms as required and wall mount your flat screen TV's. Let's just imagine that you live in such a poor area for Freeeview that even we can't help. What do you do? Well, unlike years gone by you can now actually have the benefits of Satellite TV without having to pay the monthly fee, all thanks to Freesat. Enjoy 200+ channels and a crisp picture all for a one-off fee instead. And that's not all. Purchase a decent quality Freesat box such as this and you can pause, rewind and record TV just like you can on Sky's box. As you would expect from us, we can supply all the equipment for you, and install it of course! Single room or multiroom set-up, we can do it all. We are now accepting card payments- no need to have cash or a cheque handy! ... and a criminal background check provided by Sterling Backcheck. 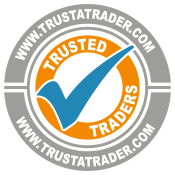 We are lsited on trustatrader.com - proving we can trusted as or place on their website depends upon our quality of service.